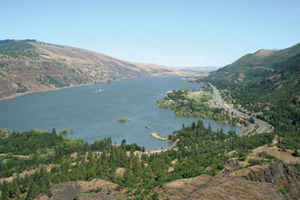 Our Vessel – The Columbia Queen is a member of a three-ship armada touring the rivers of the Northwest. With four decks, 218 feet in length, panoramic views from most of the 75 staterooms, a guest capacity of 150, and a crew of 57, passengers received excellent service, attentive concern, outstanding food, informality in dress, incomparable sights and sightseeing experiences. The Crew – The first evening, we were introduced to Captain Vince Bradford, who was to personally steer us through each of the locks; Mel Drybread, Cruise Director (first week of service) who also doubled as the guitar player in the 4-piece band; Pat Workman, our Discovery Guide who provided lectures and information on our tours and was available for questions each late afternoon; and the cooks, cabin stewards and Purser. The next day, we met the three knowledgeable bus drivers of the comfortable vehicles who provided the lectures and videos during our land excursions. The Passengers – Many of the 142 participants were retirees from the Southern states of Georgia, Florida, North Carolina, and Alabama; eight from the Midwest; six from New England; and 14 from California, Arizona, and Oregon; with two from the Bahamas. This demographic differs from ocean cruise attendees in size and international representation. Our collective reason for the trip was the same – we wanted to see the Columbia and Snake River country and learn more about L&C. Staterooms– They were luxurious, many with great window and veranda views, heavy Pendleton blankets, easy chairs, and an entertainment center. One needs a laptop for computer services. However, there were wireless hookups at most ports. Diversions – Much of this took place in the dining area – The Astoria Room. The entertainment consisted of nightly performances by two singers and the Columbia Quartet band. Each show featured songs from a different musical era: WWII, film hits, music from the ‘40s and ‘50s, and a night of dancing, as well as a special appearance by banjo artist, Will Kiefer. Other activities included field trips, CD viewing, the scenery, a well-stocked library and lectures by our Discovery Guide, which prepared us for each of the forthcoming daily adventures. Food and Beverages – We had great meals in the Astoria Room served by our suite stewards who doubled as servers in the evening. Menus included appetizers, salads, four or five entrée choices with lots of variety and a choice of desserts. Additionally, The Back Porch served complimentary snacks and drinks 24/7. So you always had an alternative to the larger portions of dining room meals. New friends included many interesting co-travelers: Bob and Eileen Forsyth from Pensacola, Florida. Bob is a former career Navy officer who captained destroyers all over the world; Fred and Marsha Hass, Houston, Texas, (Bob headed Toyota auto dealerships in Houston); Donald and Rosemary from the Bahamas (he was also a car dealer); five folks from Alabama who “…always wanted to visit the Pacific Northwest; and many other friendly individuals “lured” by the “lore” of L&C. Today, the “lure” is not only the “lore,” of those fascinating tales from history, but the spectacular beauty all of us can admire and experience personally. For information, contact Cindy Anderson, USA River Cruises, 800-578-1479. Day One – Boarded, unpacked, welcome champagne reception, sailed up Williamette River to Columbia - two dinner sittings – 5:30 pm and 7 (faithfully adhered to), 9 pm “Kick Off” to meet the Captain, senior officers, discovery guide, Cruise Director, entertainers and other crew members. Day Two – Passed Multnomah Falls (624 ft. high) - lecture on the week’s exploration and purposes of dams and locks– docked at Stevenson, Washington, and visited the Columbia Gorge Discovery Center –sailed through Columbia River Gorge and three dams and locks. Day Three – All day tour. Visited Tamastslikt Cultural Center providing good look at the Indian’s prospective of L&C, the arrival of pioneers, and the extent of settlements in the area. In Pendleton, toured the blanket factory to watch the dyeing, spinning and weaving of their famous blankets at Woolen Mills. Explored the former underground premises of drinking, gambling, and prostitution activities of the historical town, enjoyed a luscious barbecue lunch at Hamley’s saddle shop and salon. Returned to our ship docked at Sacagawea State Park. No Internet connection. Day Four – Docked at Lewiston, Washington. In the morning, JR Spencer, a member of the Nez Perce tribe, gave onboard lecture on Indian history and culture in authentic costume. 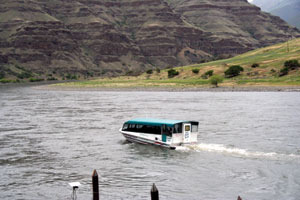 At noon, we began our jet boat excursion into Hell’s Canyon along the Snake River, highlighted by L&C’s noted experiences in the area. We stopped for a free snack at a lodge on the return trip. Day Five – Spent aboard ship. Morning lecture on L&C’s“Northwestern Discovery.” Bingo and a “sing along” in the afternoon. Lecture on the Oregon Trail. Day Six - In the morning, our Discovery Guide summarized the State’s history, “Oregon’s Dreams – A Nation’s Westward Progress.” In the afternoon, our bus drivers took us through winding, uphill curves to the snow-laden Mt. St. Helens and its informative Visitor’s Center and breathtaking vistas. Day Seven – The entire day was spent in Astoria, Oregon. Starting with a bus tour of the lovely old city, the first American settlement in the Pacific Northwest, we viewed the area from the unique Astoria Column; a 164-step solitary pillar on the top of a hill, built in 1926 in recognition of Astoria’s being the first American settlement west of the Rockies. We passed by Fort Astoria and many Victorian homes, which had become nationally recognized as historical treasure, and enjoyed reconstruction of Fort Clatsop, L&C’s wintering spot in 1805 and ’06 with informative videos and exhibits. Here, for L&C fans, is a fabulous museum of duplicated artifacts, supplies, weapons, clothing, and trade items making the famous trek possible over 200 years ago. Personally, this opportunity was worth the entire trip. Back aboard ship, we had a demarcation talk. That evening, we all dressed up for the Captain’s Farewell Reception, which highlighted “thank-you’s” to all. Day Eight – Disembarked in Portland, exchanging email and phone numbers, bidding “farewells” to our new passenger friends and crew. In Portland, visits were made to the Historical Society and Art Museum. A “Gay Pride” march was also a rare experience.